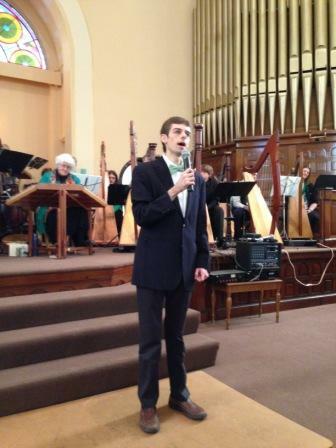 On Sunday, March 15, 2015, approximately 200 people gathered at the First Baptist Church of Albion for the first of the 2015 Eastman at Albion Courthouse Square Concert Series events. The event: Celtic Celebration of Music and Dance. The audience was treated to about an hour and a half of traditional music from across the Celtic nations, such as Ireland, Wales, Scotland, and the Isle of Man, performed by the Harmonious Harps and the Striking Strings Hammered Dulcimer Ensemble of the Eastman Community Music School ensembles, as well as solo artist, Tenor Casey Costello, all from the Western New York area. 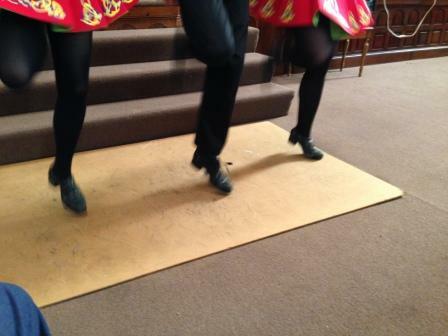 New to the Celtic event this year were traditional Irish dancers from the Drumcliffe Irish Arts, a competitive Irish dance school located in Rochester and Syracuse. 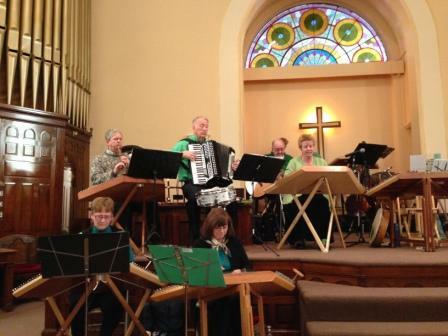 Both musical ensembles showcased an impressive variety of instruments – many of the performers played multiple instruments throughout the performance. Instruments included several harps and hammered dulcimers, as well as bass, flute, penny whistle, accordion, mandolin, guitar, Irish bodhran drum, other percussions, and a hurdy-gurdy (a personal thrill for this blogger – I have never seen one in person, before). The Eastman at Albion Courthouse Square Concert Series is presented by the Albion HS Alumni Foundation with proceeds benefiting the Foundation’s scholarship fund. As in years past, these popular concerts provide quality entertainment to hundreds of people while funding valuable scholarships for Albion High School Seniors pursuing a college education. The Foundation manages over $35,000 in scholarships awarded annually, making a difference for a lifetime for our graduating seniors. Foundation board member and Eastman at Albion Concert Series committee member, Charlie Nesbitt, kicks off the event with a few words. 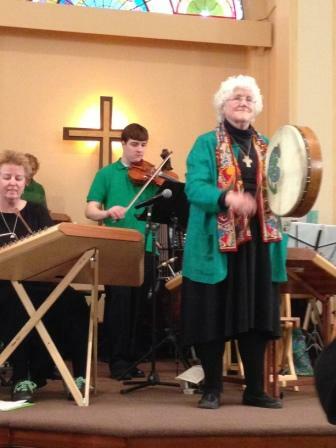 Mitzie Collins leads the ensembles – pictured here playing the Irish bodhran drum. 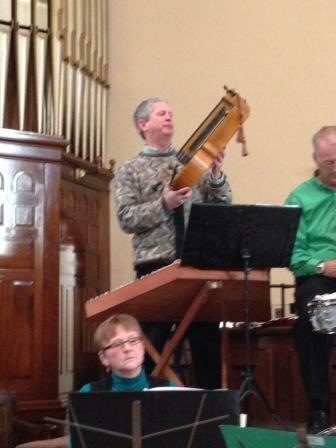 Mitzie also played the hammered dulcimer. Behind Mitzie on the violin is a high school senior from Mumford who composed one of the selections performed by the group during the concert. 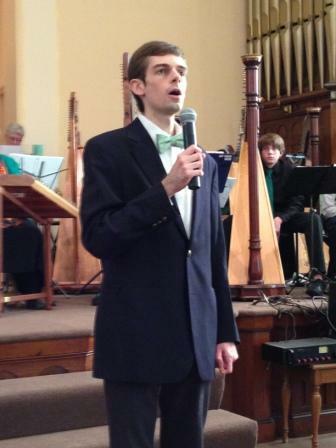 Solo tenor, Casey Costello, is pictured here singing “Danny Boy” towards the end of the evening. He captivated the audience with his amazing voice on all of the songs he performed, but this one in particular brought the audience to their feet with cheers and tears in their eyes! Although Casey was introduced as their “Irish Tenor”, he was quick to say he would be remiss if not to confess to being Italian, but “top ‘o the day to ye, just the same”! 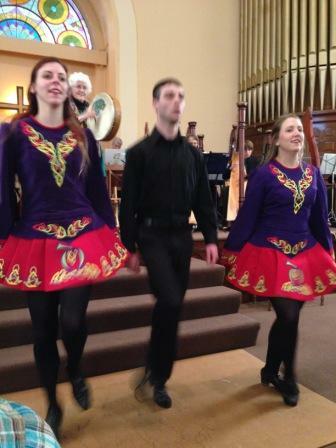 The dancers, Michael Dunning, Katie Jameson, and Casey Stevens, from the Drumcliff Irish Arts, under the direction of Edward Murphy, wore colorful costumes and demonstrated a variety of traditional Irish jigs. Their dances and, in particular, their feet were so fast that it was difficult to capture photos that weren’t a total blur!!! 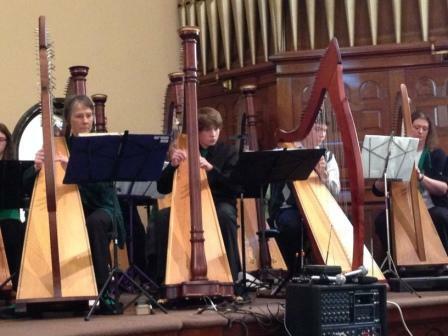 The Harmonious Harps, under the direction of Roxanne Ziegler, consisted of eight harps, including two that were played by WNY high school sophomores, Trevor Gauronski and George Rogalskyj. Here, members of the Striking Strings Hammered Dulcimer Ensemble of the Eastman Community Music School warm up by playing music to entertain the audience as they arrive and find their seats. This gentleman shows off his hurdy-gurdy instrument and explains what it is and how it is played. 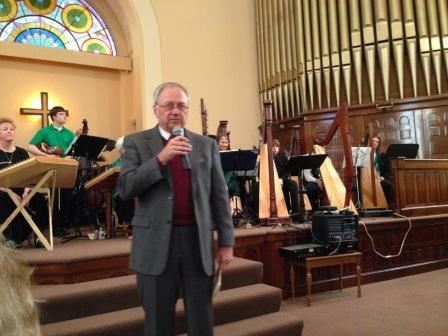 He also played the hammered dulcimer and a couple different types of woodwind instruments. Watch for more Eastman At Albion Courthouse Square Concert Series events throughout the year – come out to enjoy high quality entertainment while supporting the efforts of the Albion HS Alumni Foundation to provide valuable scholarships to Albion HS graduating seniors. Thank you to all who attended this event and to all who have attended our events in the past and those who will attend in the future. For more photos of this event, click here for the coverage on the Orleans Hub. Next Post NEW – Get Your Alumni Gear, Here!